Thanks to the many talented members here, I recently became aware of the free OSLO Edu software package. 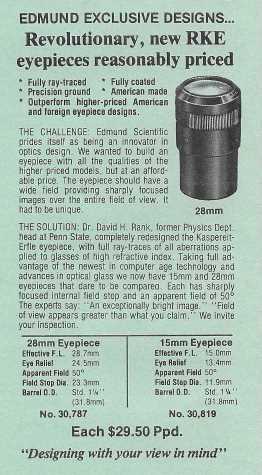 The software was very intimidating at first, and what I initially learned from the documentation is how little I really understand optics. 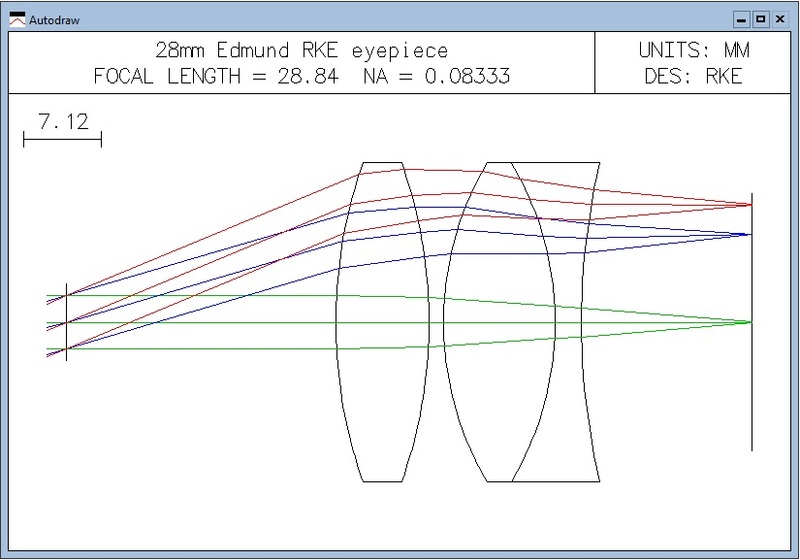 However, with the many sample files online, I was able to plough through the menus and come up with what I believe to be a reasonable model of the venerable Edmund 28mm RKE eyepiece. The technical data was obtained by inspecting their Zemax data file and pulling out the pertinent parameters. However, the generated spot diagrams do not quite look right to me. I created two, one at f6 and one at f10. I expected the tightest spot to be at zero shift focus. That is not the case, so I am sure that I am doing something wrong. Another thing I would like to do is estimate the apparent field-of-view (AFOV). From what I have discovered so far, is that the AFOV is simply entered as a parameter and there is no way to solve for it. Hopefully, someone here is knowledgeable enough in both optics and the OSLO program to help me sort things out. Edited by John Rogers, 23 January 2019 - 11:15 AM. Hello, Dr Rank optimised the RKE for "deep sky" on the Astroscan, so around the classic area at the maximum surface. Do not forget to consider the Astroscan vs RKE eyepiece curvature too by putting 222mm in the IMS radius. Thank you for your response Myriam. Where did you get the 222mm value from? I notice in your 8mm sample file, the value is set to zero. I thought the curvature of a Newtonian was equal to its focal length. which makes it positive (concave toward mirror) for mirror oriented to the left, regardless of mirror conic. Position of the aperture stop influences mirror astigmatism, which in turn causes changes in the median image curvature. As Eq. 39 shows, it varies somewhat with the conic. For a paraboloid, best image surface is flat with the stop at half the focal length from mirror, and with the stop at the focal length away mirror astigmatism is cancelled, but image curvature equals R/2 (convex toward mirror). For a sphere, best astigmatic field is flat for the stop at (1-0.51/2) focal lengths from mirror, and astigmatism is cancelled for the stop at the center of curvature." Represented charts looks fine and correct. There are expected from this eyepiece: strong field curvature and astigmatism + some signs of lateral chromatic aberration. 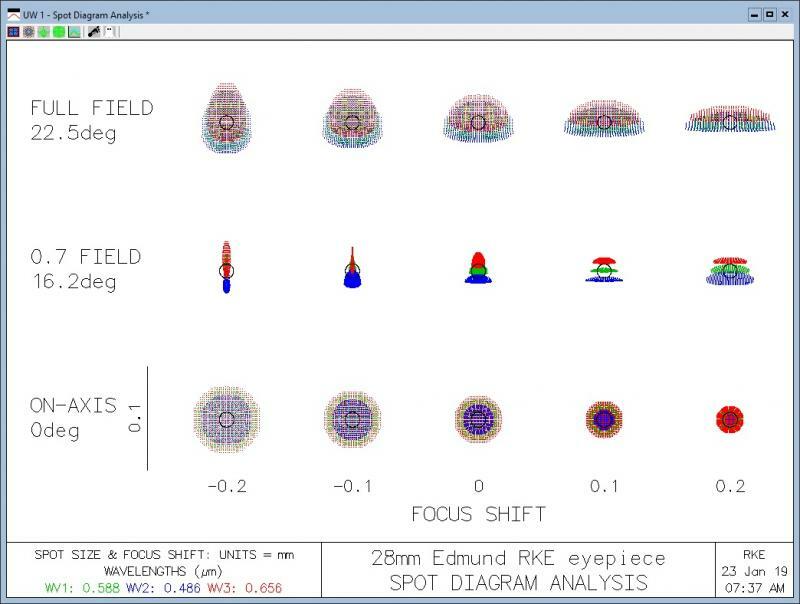 Just a tip: to have correct understanding of an eyepiece optics set focus to minimize aberration spot size on axis. It isn't properly focused. To focus on the axial spot, do Evaluate>Autofocus>Minimum on-axis RMS OPD (you want monochromatic if you want to see error in #1 wavelength). Lateral color can be minimized by using glasses that weaken positive (blue) dispersion, e.g. SF11 for the negative element, or PSK2 for the two positive elements. 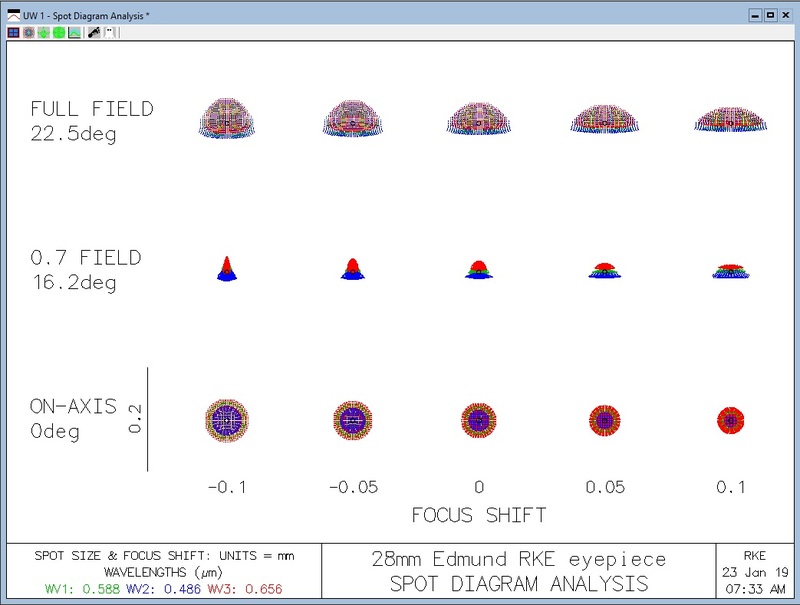 It is interesting to see that even with moderate fields some eyepieces already have spherical aberration of exit pupil, which is why 0.7 field cone comes in at a converging angle (can't possibly happen with a telescope, since all central cone rays originate in the center of the aperture stop). In this case, actual 0.7 field rays form exit pupil more than 2mm farther from the eye lens than marginal rays. Thank you for your contributions everyone. The focus tip from Ernest and Vla makes the plot more as I expected. This place is great! 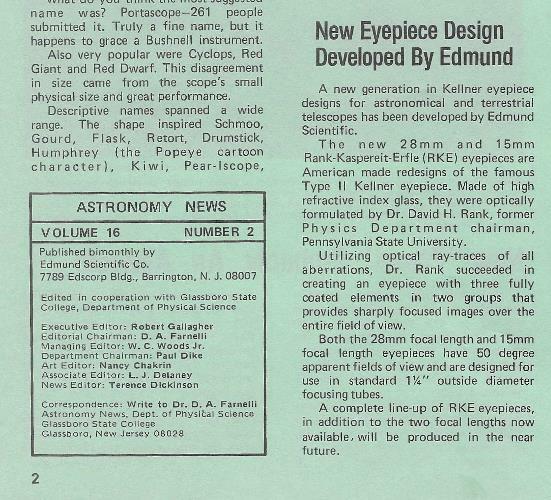 Here is an original announcement from Edmund in early 1978 introducing the RKE eyepiece. A goal was to have a sharply focused image across the entire field of view. Fast forwarding 40 years later and given the technology at the time, did they meet their objective? While I can infer which spot diagram is for which focal ratio, is there a way for that program to include the focal ratio in the chart? And for what it's worth, the F/6 diagram very closely resembles what that eyepiece looks like in my F/5 dob. Not that I have found so far. I've been sure to include the focal ratio in the image filename. Here is the eyepiece at f5 with the focus set properly. How does that fit your observed performance? Unfortunately, you didn't add coma to the image to generate what is actually seen, only what is inherent in the eyepiece. The astigmatism, added to the coma, results in a funky seagull shape at the edge. Yeah that looks pretty accurate. As you get progressively further away from the center, the stars become longer and longer semi-circular streaks that curve around the field. Though I do say I see more astigmatism than the plot shows, but I'm also not using a coma corrector, so there could be some convolution of aberrations that account for the disparity. What Don is describing sounds a bit more like what I see at the edges of the field. Edited by CrazyPanda, 24 January 2019 - 05:24 PM. Retro-engineering complete to OSLO but may not be right for thicknesses. The RKE8 is a much complex than I believed : not a resize from the 12-29mm range. 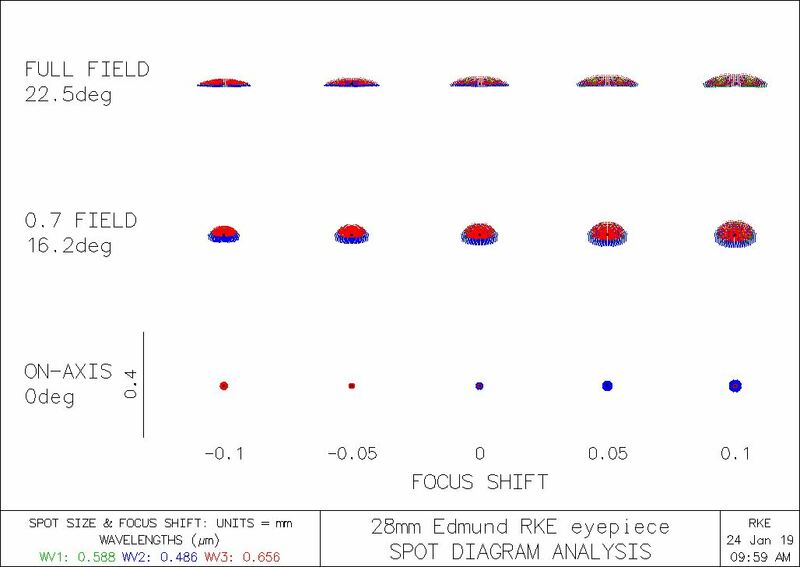 I run it in OSLO, and while good overall, it can be improved (lateral color) by using SF6 instead of SF4, with R5 weakened to -7mm to reduce astigmatism to a nearly comparable level. Field curvature is also weaker (goes from about 0.2mm edge displacement to 0.13mm, corresponding to about 2 diopters, i.e. accommodation from infinity to 0.6m). It can be really sharp, practically astigmatism-free over 45-deg field if allowing for about twice stronger field, which is still within accommodation ability of average eye. RKE is a form of Koenig, as good as a 3-element spherical eyepiece can get.